• High flow rates complement our AR series pressure relief valves and burst disks. • Pressure Rating: 725 PSI (50 bar). • Temperature Rating: -325°F (-198°C) to +165°F (+74°C). 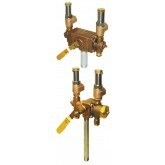 Assy - Relief Valve 1-1/2" x 1"